• Blogger Alan See’s luncheon presentation to all attendees reviewed the ways in which the rise of social media impacts the entire organization and its ability to compete in the increasingly digital, connected world. Alan See also met with the Distributor/ Manufacturer Relations committee after lunch for a more in-depth presentation. • The Information Technology and Supply Chain Committee meeting featured a presentation by Doug Josey about the mobile apps that Emerson Industrial Automation has developed for their authorized distributors and the public. BSA has been actively pursuing options to leverage the strength of social media to enhance communications between the distributor and manufacturer. The positive meeting review came from 100% of those responding to the post-meeting evaluation. 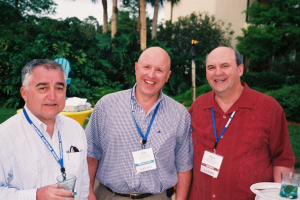 The compact Winter Meeting schedule and relaxed atmosphere enhanced networking opportunities. BSA will host its 2013 Annual Convention May 4-7 at the Westin Hilton Head Island Resort and Spa on Hilton Head, South Carolina. To learn more, please visit the convention website at www.bsaconventions.org. BSA is the “must belong to organization for authorized bearing distributors.” An international service and educational organization of distributors representing a total of almost 100 companies distributing factory-warranted, anti-friction bearings and invited manufacturers of bearings and related products, the association’s mission says, “BSA is the forum to enhance networking and knowledge sharing and promote the sale of bearings through authorized distributors.” To learn more about the 2013 Annual Convention, please go to www.bsaconventions.org. For more information on BSA, contact the BSA office at (630) 858-3838; fax (630) 790-3095; email info@bsahome.org or visit the association website at www.bsahome.org.